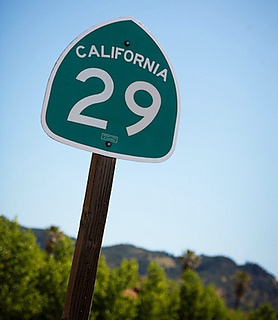 Highway 29 is the main roadway running up through the Napa Valley in Northern California, where summers are scorching hot and halter tops are in fashion, worn casually and for dress. Seamless construction with combination in-the-round & knitted flat. Bottom up lace rib pull-over fits snug from high hip up to under-bust, then piece ‘divides’ into a left & right edge and knit flat. 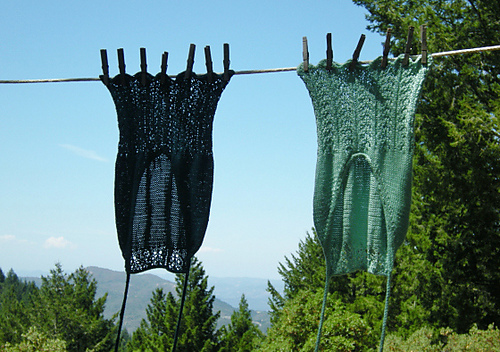 Shaping and bust size is achieved through increases and then decreases, and finishes with lace panel. A sturdy thick applied i-cord edges entire garment, swooping along back edges & continues into ties for a firm suspension hold. Fitted under-bust to custom full bust, including no-increase version. 6 sizes, with custom shaping of 0”-4” bust increase options so that your garment will fit like a dream. Note: This is a very tricky knit, intermediate-advanced, recommend only to knitters experienced with icord, applied icord, and keeping lace pattern through shaping. Fitting Suggestion: Measurements on pattern are of actual garment -- make one or two sizes smaller around bust & underbust than measurements of person if a firm hold & form-fit is desired, so that fabric can stretch and not drape. Bra Notes: Halter in light aqua color is modeled slung low and worn with adhesive gel bra cups. Halter in dark teal is modeled pulled up to collar and worn with strapless bra, covering the back of bra. Note: See photo HERE to see best blocking method. Child Sizing: Mini Halter project with helpful notes HERE. I invite Any & All who are knitting Highway 29 Halter to bring questions, comments, and otherwise general pattern-related chattiness to my Jenjoyce Group which exists just for knitters of Jenjoyce’s patterns. Look for the thread for Highway 29 Halter. The kettle is on… see you there !